Sharing Stories. Mapping Visions. Making Change. Storytelling is a whole body-heart-mind-soul experience and working with stories invites us to learn about and understand our world holistically. This workshop is an offering of some of the ways which I have worked with story to help facilitate learning new perspectives, experiencing new ways of doing things and evolving change. Using a Story Circle framework, I will guide you through a range of activities which move between personal reflection to group sharing. The workshop content will be guided by your areas of expertise and interest so that you can adapt these storytelling tools to be relevant in your own personal and working contexts. This workshop aims to be a combination of exciting ideas, deep listening, relaxing reflection and practical strategies for making change through storytelling. At the end of the workshop you’ll have some new ideas for ways to think about and plan for change using stories and story thinking as a foundation. I hope that you’ll feel more confident in your ability to tell meaningful stories and that you’ll feel supported by a network of new friends, to facilitate change in your work, life and community, in ways which work for you. I am interested in the power of language and stories to influence, direct and reflect our personal, family and community culture. My workshop models ways for us to develop a deeper awareness of the stories we tell ourselves and the dreams which drive us to help create our future. 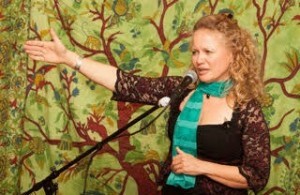 Anna Jarrett is a professional storyteller, facilitator, teacher, consultant and outdoor guide. With 30 years experience, Anna’s work with story is a diverse mix of projects and programs which celebrate and facilitate inspiring learning environments for community stories, environmental education, reflection, creative writing, wellbeing and outdoor adventure/reconnection journeys. Drawing from a deep belief that stories help us to make and to map our life journeys and our futures, Anna enjoys working with traditional and contemporary stories which inspire, empower, heal and guide us as individuals and communities. Recent projects include Education Dreaming, an oral history book publishing project with Aboriginal women from south coast NSW, and The Shorebird Book Project with National Parks NSW and school students on the south coast. Anna’s greatest joy is to create places and spaces where people gather together to share their stories, to write them, sing them, play them, tell them and to continue to imagine them. Her work is driven by a vision of individuals and communities being deeply connected to themselves and to their place through stories, with all the wonder and knowledge which stories can contain.